There not much good that comes out of Hollywood these days. Other than a few family or Christian films that emerge every so often, the industry has mostly become a cesspool of immorality, obscenity and violence. In earlier years, however, movies were generally far different... and were often made to inspire decency, morality and such values as faith, family and patriotism. Such was the 1946 Frank Capra film, It's a Wonderful Life, starring James Stewart and Donna Reed. 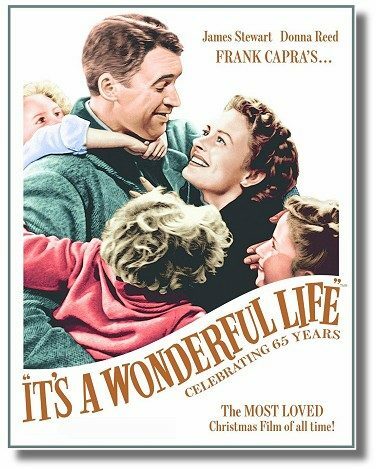 This heart-warming movie, set during the Christmas season, portrayed an angel-in-training who answered the prayer of a despondent man (Jimmy Stewart) on the verge of suicide, giving him a glipse of what the world would be like if he had never been born. As a result, he had a change of heart and returned to his family and friends with a new appreciation for life. It's a Wonderful Life may be the finest, life-changing picture ever produced by Hollywood, a movie that everyone should see and show to their families. While it was nominated for five Academy Awards including Best Picture in 1947, the release initially received only modest box-office success. However, the continued replays and eventual distribution on video and DVD, made it one of the most popular films in history. It was recognized by the American Film Institute as one of the 100 best American films ever made, and the top inspirational film of all time. Capra said that this was his personal favorite among the many films he directed, and Stewart later conceded that it was also his favorite of his 80 films. Today, millions consider it a classic holiday film, viewed as an annual Thanksgiving or Christmas tradition. 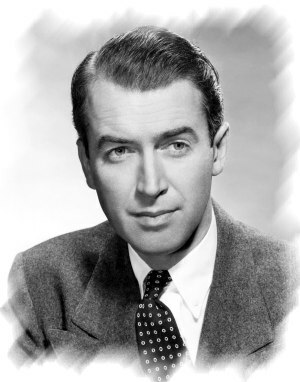 Of special significance is the following article about the making of It's A Wonderful Life, originally written for Guideposts Magazine, by actor Jimmy Stewart. Many are unaware that besides his legendary film career, and heroic service as an air force pilot during world war II, Stewart was also a Christian, with personal values that resembled some of the heroic characters he portrayed. I have always felt that George Baily was really a depiction of the heart and soul of Jimmy Stewart, a kind and decent man. Stewart died in 1997 at the age of 89, but he will never be forgotten for his many moving performances, and the uplifting inspiration he gave to so many. "A friend told me recently that seeing a movie I made in 1946 is a holiday tradition in his family, 'like putting up the Christmas tree'. That movie is It's a Wonderful Life, and out of all the 80 films I've made, it's my favorite. But it has an odd history. When the war was over in 1945, I came back home to California from three years' service in the Air Force. I had been away from the film business, my MGM contract had run out, and frankly, not knowing how to get started again. I was just a little bit scared. Hank Fonda was in the same boat, and we sort of wandered around together, talking, flying kites and stuff. But nothing much was happening. Then one day Frank Capra phoned me. The great director had also been away in service, making the Why We Fight documentary series for the military, and he admitted to being a little frightened too. But he had a movie in mind. We met in his office to talk about it. He said the idea came from a Christmas story written by Phillip Van Doren Stern. Stern couldn't sell the story anywhere, but he finally had 200 twenty-four page pamphlets printed up at his own expense, and he sent them to his friends as a greeting card. Production of It's a Wonderful Life started April 15, 1946, and from the beginning there was a certain something special about the film. Even the set was special. Two months had been spent creating the town of Bedford Falls, New York. For the winter scenes, the special effects department invented a new kind of realistic snow instead of using the traditional white cornflakes. As one of largest American movie sets ever made until then, Bedford Falls had 75 stores and buildings on four acres with a three block main street lined with 20 full grown oak trees. Dad disappeared and came back with four men. 'You must not have looked very hard, Jim,' he said, 'because there's a Presbyterian church just three blocks from here, and here are the elders. They're building a new building now, and I told them you were a movie star and you would help them.' And so, Brentwood Presbyterian was the first church I belonged to out here. Later that church was the one in which Gloria and I were married. A few years after that it was the same church I'd slip into during the day when Gloria was near death after our twin girls were born. Then after we moved, we attended Beverly Hills Presbyterian, a church we could walk to. It wasn't the elaborate movie set, however, that made It's a Wonderful Life so different; much of it was the story. The character I played was George Bailey, an ordinary kind of fella who thinks he's never accomplished anything in life. His dreams of becoming a famous architect, of traveling the world and living adventurously, have not been fulfilled. Instead, he feels trapped in a humdrum job in a small town. And when faced with a crisis in which he feels he has failed everyone, he breaks under the strain and flees to the bridge. That's when this guardian angel, Clarence, comes down on Christmas Eve to show him what his community would be like without him. The angel takes him back through his life to show how our ordinary everyday efforts are really big achievements. Clarence reveals how George Bailey's loyalty to the job at the building and loan office has saved families and homes, how his little kindnesses have changed the lives of others, and how the ripples of his love will spread through the world, helping make it a better place. Good as the script was, there was still something else about the movie that made it different. It's hard to explain. I, for one, had things happen to me during the filming that never happened in any other picture I've made. As I said those words, I felt the loneliness and hopelessness of people who had nowhere to turn, and my eyes filled with tears. I broke down sobbing. This was not planned at all, but the power of that prayer, the realization that our Father in heaven is there to help the hopeless had reduced me to tears. Frank, who loved spontaneity in his films, was ecstatic. He wanted a close-up of me saying that prayer but was sensitive enough to know that my breaking down was real and that repeating it in another take was unlikely. But Frank got his close-up anyway. The following week he worked long hours in the film laboratory, again and again enlarging the frames of the scene so that eventually it would appear as a close-up on screen. I believe nothing like this had ever been done before. It involved thousands of individual enlargements with extra time and money. But he felt is was worth it. There was a growing excitement as we strove day and night through the early summer of 1946. We threw everything we had into our work. Finally, after three months, shooting some 68 miles of 35-millimeter film, we complete filming and had a wrap up party for everyone. It was an outdoor picnic with three-legged races and burlap-bag sprints, just like the picnics back home in Pennsylvania. At the outing, Frank talked enthusiastically about the picture. He felt that the film as well as the actors would be up for Academy Awards. Both of us wanted it to win, not only because we believed in its message, but also for the reassurance we needed in this time of starting over. As more reviews came out, our hopes sank lower and lower. During early February 1947, eight other current films, including Sinbad the Sailor and Betty Grable's The Shocking Miss Pilgrim, out-ranked it in box-office income. The postwar public seemed to prefer lighthearted fare. At the end of 1947 It's a Wonderful Life ranked 27th in earnings among the other releases that season. And although it earned several Oscar nominations, despite our high hopes it won nothing. 'Best picture for 1946' went to The Best Years of Our Lives. By the end of 1947 the film was quietly put on the shelf. Today I've heard the film called 'an American cultural phenomenon'. Well, maybe so, but it seems to me there is nothing phenomenal about the movie itself. It's simply about an ordinary man who discovers that living each ordinary day honorably, with faith in God and selfless concern for others, can make for a truly wonderful life." This article (VL-621) is copyrighted © by Dr. Dale A. Robbins, 1990-2019 and is a publication of Victorious Publications, Grass Valley, CA - Nashville, TN. Unless otherwise stated, all scripture references were taken from The New King James Bible, © Thomas Nelson Inc., 1982. You may download this article for personal use as long as you retain credit to the author. Obtain permission before reproducing copies for any reason, by filling out our simple use permission form. Many of our writings are also available as free pdf tri-fold pamphlets, which can be downloaded for reproduction from our Online Catalog. For media reproduction rights, or to obtain quantities of this title in other formats, email us. If you have appreciated these online materials, help us reach the world with the Gospel by considering a monthly or one-time tax-deductable donation.